Review: 2013-04-20, pretty good fight but not particularly exciting: Giorgio Petrosyan vs Hafid El Boustati gets two stars. Giorgio Petrosyan (75-1-2) entered as the No.1 super welterweight in the world while Hafid El Boustati (67-7-3) entered as the No.6. 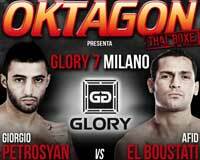 Petrosyan vs El Boustati is the main event of GLORY 7 Milan – Oktagon 2013. Watch the video! Review: 2012-06-30, great pace between Robin van Roosmalen and Hafid el Boustati: three stars. Robin van Roosmalen (35-12-3) entered as the No.5 super welterweight in the world; on the original fight card van Roosmalen was expected to face Harut Grigorian. Van Roosmalen vs Boustati is on the undercard of Peter Aerts vs Tyrone Spong (It’s Showtime 57 & 58). Watch the video!